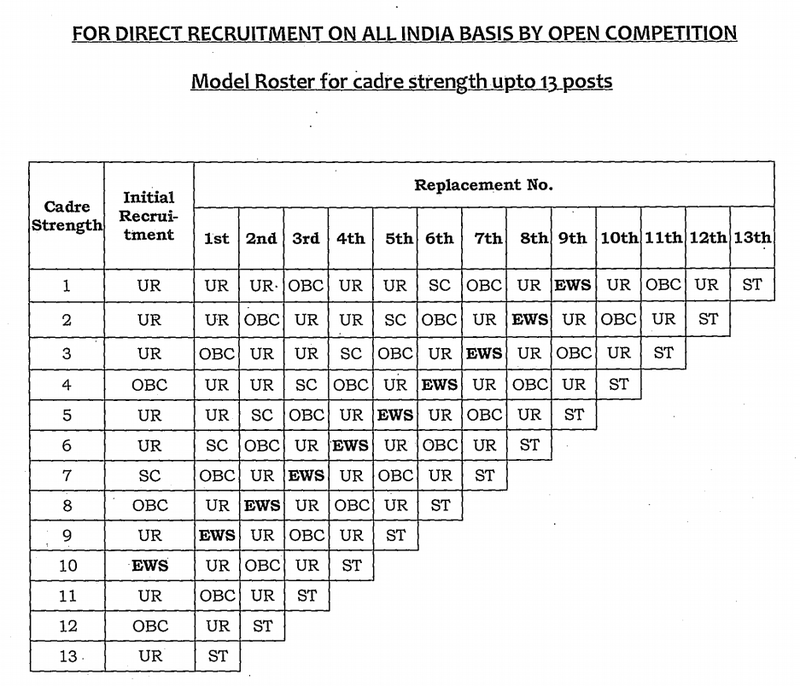 recruitment in civil posts and services in the Government of India. In continuation of this Department’s Office Memorandum of even number dated 19.01.2019, the following instructions are issued in consultation with Ministry of Social Justice and Empowerment and Department of Legal Affairs regarding reservation for EWSs not covered under the reservation scheme for SCs/STs/OBCs in respect of direct recruitment in civil posts and services in the Government of India. 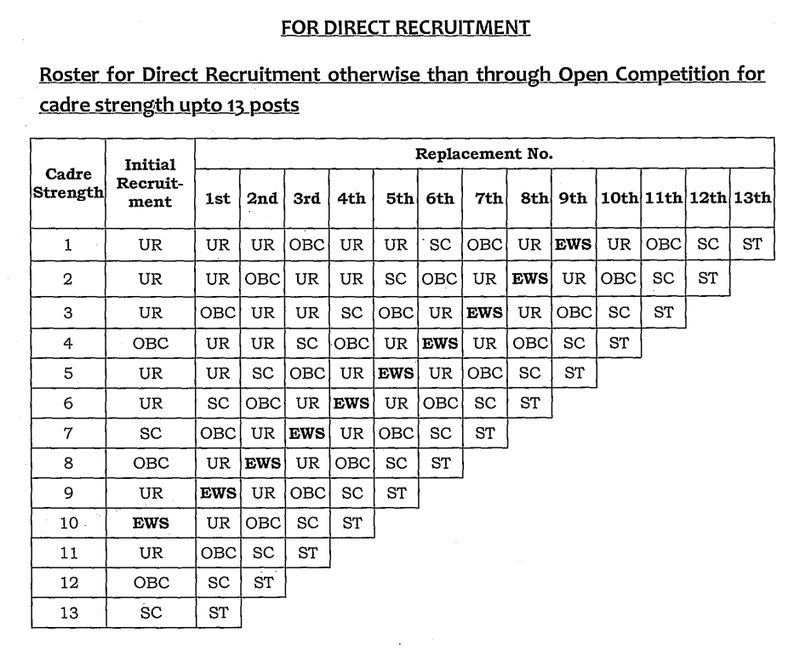 The persons belonging to EWSs who, are not covered under the scheme of reservation for SCs, STs and OBCs shall get 10% reservation in direct recruitment in civil posts and services in the Government of India. .
(ii) They should be classified as “scientific or technical” in terms of Cabinet Secretariat [OM No. 85/11/CF-61(1) dated 28.12.1961], according to which scientific and technical posts for which qualifications in the natural sciences or exact sciences or applied sciences or in technology are prescribed and, the incumbents of which have to use that knowledge in the discharge of their duties. 4.1 Persons who are not covered under the scheme of reservation for SCs, STs and OBCs and whose family has gross annual income below Rs 8OO lakh (Rupees eight lakh only) are to be identified as EWSs for benefit of reservation. Income shall also include income from all sources i.e. salary, agriculture, business, profession, etc. 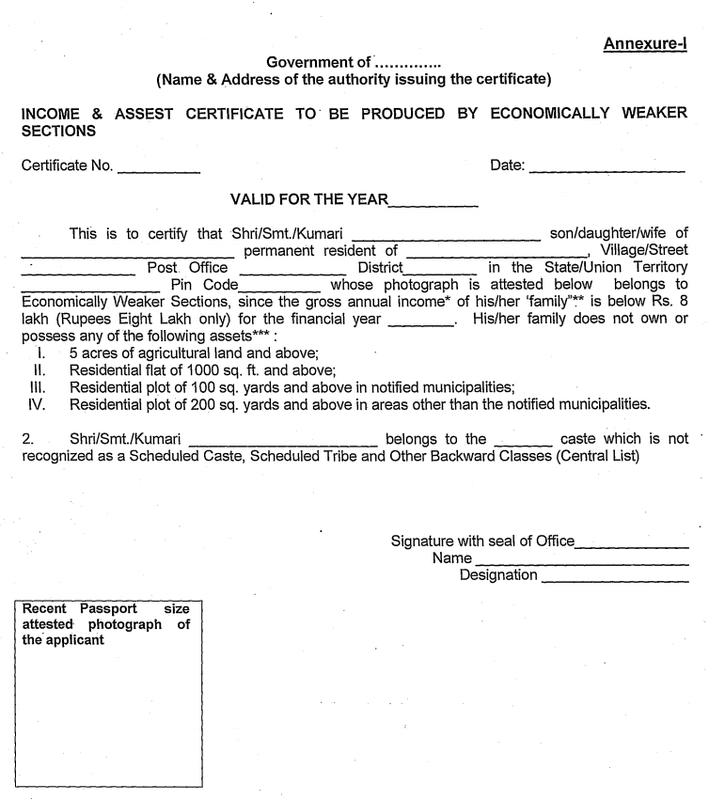 for the financial year prior to the year of application. 4.3 The term “Family” for this purpose willinclude the person who seeks benefit of reservation, his/her parents and siblings below the age of 18 years as also his/her spouse and children below the age of 18 years. The Ministries/Departments shall send single consolidated fortnightly report including their attached/subordinate offices beginning from 15.2.2019 as per format at Annexure-VL -. From 01.01.2020, the Ministries/Departments shall upload data on representation of EWSs in respect of posts/services under the Central Government on the URL i.e. www.rrcps.nic.inas on 1st January of every year. All Ministries/Departments have already been provided respective usercode and password with guidelines for operating the URL.